We have another radio show that we're happy to put in the mix on the site that fits in with the positive Black Radio experience and experience called The Vincent Tucker Radio Show with some good music and vibes. CWC Entertainment Group L.L.C. 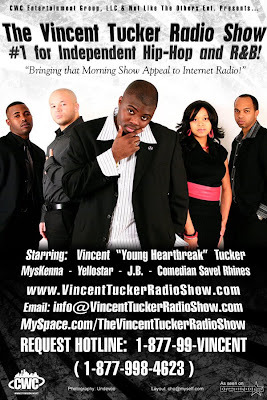 proudly presents the 56th episode of The Vincent Tucker Radio Show. What happens when your favorite radio show throws out the format and the paperwork? Well just like Young Jeezy, we're going with ab-libs today. The Ever-So-Rising Comedian "Q" joins the conversation today as he shares his thoughts on the various topics that we have on deck. For the second consecutive week, Vincent's special friend Shiquell drops by! He avoided the question last week but is one of Hip Hop’s rising bachelors still one? Known as the "Voice of the Unknown", this week's episode is sponsored by Poor Man's Music, Citystream Live and The Dallas Greek Picnic coming June 4 - 7, 2009.